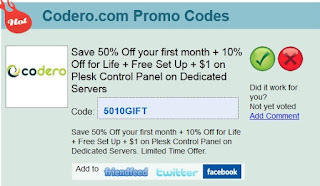 The year 2012 is coming to an end, and with that I am happy to bring you some Codero Promo Codes , where you can get a domain name for only $1.99. As I understand, if you love Wordpress platform, then you will have to buy a registered domain first, and have it host on Wordpress. This would be a great time to make the transition, or buy that first domain name. Click on the link in this post and you will see other services on Domain Promote Codes website, such as managed services, power bundle with Core 2 duo, or Core i7 Quad Core. I believe this is the lowest deal I've seen so far. Having three websites, I know this is a significant savings as I pay more than two dollars for my domain names. If you have been thinking of establishing a domain name or starting a blog, it is now the time. New Year is coming, and it is time to grow, to learn, and to expand our horizon! I hope you will take advantage of this offer or at least look it over to see what type of service would suit you best. If you need to renew your domain, there is a discount for that too. Is it possible to find something pretty left in a world that is going doorman? I know it is since “It's not what you look at that matters, it's what you see”, (By Thoreau)! If I can't find beauty straight away, I take a step back, and then look for another angle. Yes, sometimes I even surprise at myself but it doesn't take much for me to be excited. A little sunlight flickering on top of the leaves was more than enough. It might take me a while to find the perfect spot to shoot, or I might just shoot enough photos to weave through once they were uploaded to my computer. 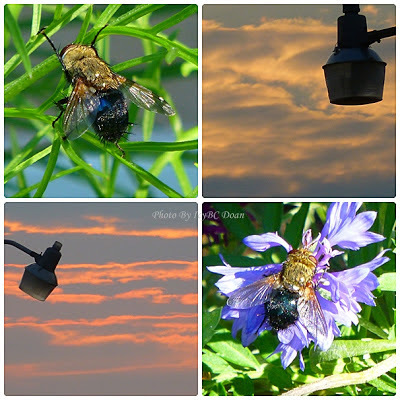 I see the beauty in each of the photos above! They are simple with just a touch of colors. In this cold weather, seeing them still growing was such a joy. We had lot of this critter around our yard during the summer. It looked like grasshopper, but really not. The black color part on this critter you see is its wings. Yes, it could fly and usually for a short distance. 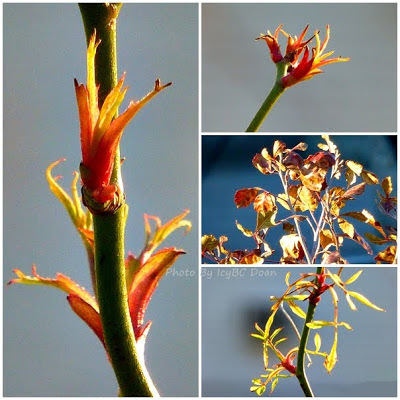 Every year there is one rose branch that still has new growth and the colors are quite amazing in such a gloomy cold weather. Many parts on this wild rose plant are bare and brown, except for this one.